Outgoing postcard US-3202774 to Finland shows the Wrigley Building at the Northern end of the Michigan Avenue Bridge, built in 1920 to house the corporate headquarters of the Wrigley Company, a chewing gum company. 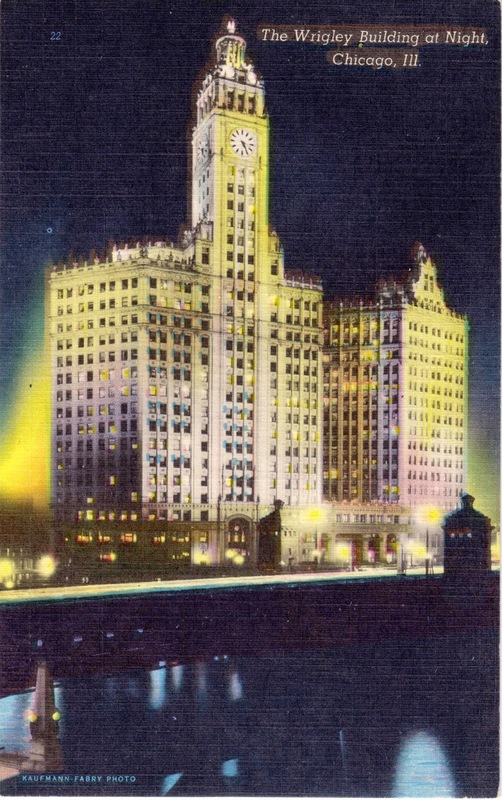 The backside of the postcard reads: "It towers 398 feet above the ground and is shown in magnificent splendor by being entirely illuminated at night." However, it was noted on Wikipedia that the 30-story south tower, completed in April, 1921, is 425-foot or 130-meter tall. The Wrigley Building was sold to a group of investors in 2011. On a side note, Chicago marks anniversary of 1967 Blizzard that lasted 17 hours and dumped 23 inches snow 48 years ago on this day. It was the largest single snowfall in the city's history. About 50,000 cars and buses were abandoned on the streets and expressways; thousands of people were stranded. It took several days for schools and airports to re-open. While blizzard warnings expired for New England, heavy snow continues under winter storm warnings and advisories. On the other hand, Chicago only had freezing rain this time, which still caused dangerous driving conditions. Some sunshine is expected in Chicago tomorrow afternoon.